How many times have you hit a schematic capture roadblock because you couldn’t find a component symbol? Well, in EasyEDA that would be never because the Schematic Library Wizard provides a quick and easy way to create a general schematic library symbol. The Schematic Library Wizard… command can be found in the top toolbar. Using the NE555 timer as an example: this device is available in a DIP8 package so select DIP. Then enter the NE555 pin names into the Pin Names text box separated by new line or space, Then press OK. Abracadabra! As if by magic, you will find a perfectly formed dual in line 8 pin symbol for the NE555 attached to your mouse cursor, ready to be placed! You just need a few seconds to build a NE555 symbol, quickly and easily. The EasyEDA Schematic Symbol Wizard allows you to create DIP, QPF or SIP styles symbols. If you are designing Arduino Shields then you will need lots of SIP symbol, so you can create a SIP symbol like the one shown below in a few seconds. 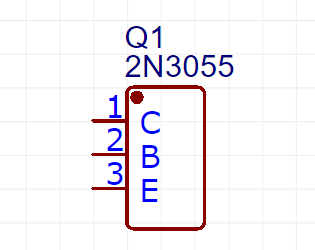 Schematic library wizard support you input the pins’ number and name. As below example, setting every pin’s number is easily. Schematic Library Wizard support the professional function, it is easier to create the large and complex and more convenient schematic library. 2.Open it via Excel or WPS, and edit each Pins attributes and position, and then copy the content and paste in wizard dialog without content title. Tip: If you want to create the gap between Pin and Pin, you can use the * as below image. 3.The Wizard will create the symbol follow your content. The types you chosen will be ignored. If the content you input wasn’t one, two or eight columns, it will shown incorrect format. You can use the Key Space to separate the column data.